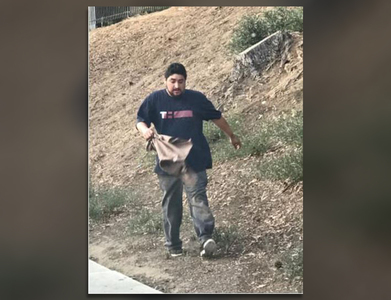 ESCONDIDO, Calif. (KGTV) -- An Escondido woman said she recognized a photo of a man suspected of trying to kidnap a 15-year-old girl. The man, Edgar Gutierrez, is a former coworker. And she immediately called the police. “My heart started pounding and I was like, oh my goodness, that’s my old co-worker Edgar, and I immediately knew it was him,” Erica Windham said. Windham said she saw the photo of the suspected attempted kidnapper on a community Facebook page. The photo shows a heavy-set unkempt man with a beard walking in the dirt next to a sidewalk. “That’s him, down to a T,” she said. “I worked with him some years ago, about four or five years ago, and it was just a little fast food job during summer and stuff." Windham also tagged Edgar Gutierrez in the attempted kidnapping post on Facebook. She said he messaged her soon after. “He said this isn’t me. And he said, 'why are you tagging me in this? I’ve been receiving all sorts of messages.' I said, well I’m tagging you because I’m pretty sure (it) shows you are the culprit,” Windham said. “He told me he doesn’t have those shoes and he was with his family and they can vouch for that, and I’m like, ok, tell it to the judge, don’t tell me." Escondido Police identified 28-year-old Edgar Gutierrez Gutierrez of Escondido Thursday. With the assistance of the U.S. Marshal’s San Diego Fugitive Task Force, Gutierrez was located in the City of San Diego at about 6:15 p.m. and taken into custody.